The first election which ended in a dispute was the election of the 1800 our fourth election. In that election, the Federalists nominated John Adams to be President and the Charles Pinckney to be Vice President. The Democratic-Republicans nominated Jefferson as President and Aaron Burr as Vice President. The Democratic-Republicans made the mistake of assigning the same number of electoral votes to both Jefferson as Burr. Thus no one had the majority of votes, and the election was turned over to the House of Representatives. The House deliberated from February 11th to February 17th and voted 36 times. The Federalist had decided to support Burr, whom many felt was a lesser evil than the "dangerous" Jefferson. They would have won since they were the majority of the outgoing House. However the constitution called for the election of President by the House to be on a state by state basis, and the Federalist could not carry enough states. On the 36th ballot, Jefferson was selected, but the country had come very close to having Aaron Burr as President. In the immediate aftermath of this election, there was a call to amend the constitutional provision requiring double balloting for President and Vice President. It was eliminated by the passage of the 12th amendment, which was approved by Congress in December 1803 and ratified in time for the election of 1804. The election of 1824 was the second and last election decided by the House of Representatives. The four major candidates were John Quincy Adams, Henry Clay, William H Crawford, and Andrew Jackson. When the electors were counted Jackson had 99, Adams 84, Crawford 41 and Clay 37. The election was thrown to the House of Representatives with the three leading candidates competing. All of the candidates hoped for support from Clay and his supporters. Before the House met a scandal erupted when a Philadelphia newspaper published an anonymous letter claiming that Clay would support Adams in return for an appointment as Secretary of State. Clay vigorously denied this. Adams won on the first ballot of the House of Representatives, and later appointed Clay as Secretary of State. 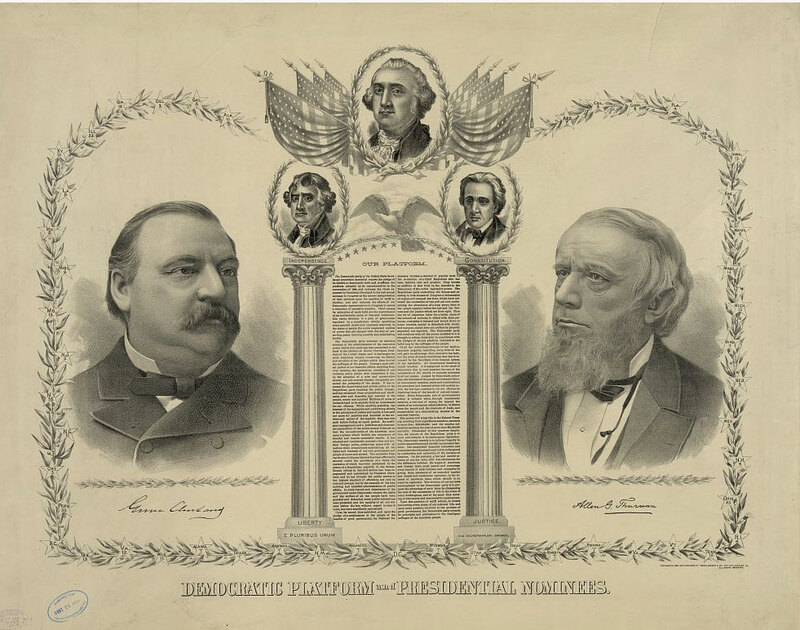 In 1876 the Democrats nominated Samuel Tilden, and the Republicans nominated Rutherford Hayes. When the election results were in Samuel Tilden had won the popular vote by 250,000 votes out of a total of 8.5 million votes cast. The electoral vote, however, was tight, and in three southern states, the results were hotly contested- South Carolina, Florida, and Louisiana. All three were sharply divided between Whites and newly enfranchised Blacks, between supporters of Reconstruction and those who wished to bring it to an end. All three states ended up empowering two separate slates of electors. Congress passed a special law to decide the results of the disputed vote. That law created a 15 member commission made up of five senators, five members of the House and five Supreme Court justices. Initially, the swing or fifteenth member of the commission was an independent. However when he was appointed to the Senate, he resigned, and a Republican replaced him. The commission then met and in each of the three cases of disputed state slates they accepted the Republican slate. Under the law that the commission had been set up under, the decisions of the commission could be overturned by a vote of both houses of Congress. The House rejected the findings while the Senate accepted it. The House Democrats threatened a filibuster to block the resumption of the count of the electoral votes. The Democrats did not go through with their threat when Hayes agreed to withdraw federal troops from the south thus ending reconstruction when he became President. He was selected. In the election of 1888 Grover Cleveland the incumbent Democratic President faced Republican challenger Benjamin Harrison. Cleveland won the popular vote but lost the electoral vote. This took place because Cleveland overwhelmingly won states with smaller number of electoral votes while losing certain key states by only a few votes. Harrison became President but lost to Cleveland in a rematch four years later. In the 20th century, there were two very close elections. In 1960 a little over 100,000 votes ended up separating Vice President Nixon and Senator Kennedy. When it became apparent that Kennedy had won Illinois Nixon conceded. There have been some references made to the similarities between the 2000 election and Nixon's concession. The similarities are limited. Kennedy held a lead in the popular vote throughout, and in the state most in question- Illinois Kennedy won by 8,000. Even if Nixon had carried Illinois, he still would have lost. The 1976 election between President Ford and Governor Carter was close in the Electoral College, but Carter won by a commanding 2,000,000 votes in the popular votes. The closest election in US history began with a night of errors for the major networks. The first error occurred when they declared that Al Gore won the State of Florida. That victory it seemed made an electoral victory by George Bush unlikely. As the night went on the networks retracted their call and placed Florida in the undecided camp. Later in the night, it became clear that the Florida decision would determine the elections. A little after 2 AM Eastern Time the networks made their next mistake, declaring the State of Florida for George Bush. That declaration set in motion a concession phone call by Gore to Bush. As Gore was about the make his concession speech, word reached him that the State of Florida was indeed too close to call. Gore called Bush back and recanted his concession, and the recount stage of the Florida election was on. Most Americans went to sleep believing that Bush had won, they woke up to learn that the election had not been decided. The margin between Bush and Gore was 537 votes out of a total of 6,000,000 cast. The Gore campaign demanded a recount in many areas of Florida; the Bush campaign tried to block in court. The Gore campaign won motion after motion in local and Federal courts to allow the recount to continue, so finally, the Bush campaign then turned to the US Supreme Court. Most experts on the Supreme Court did not believe it would agree to hear the case, but it did. It then rendered one of the most controversial decisions in its historic ruling that the vote recount must be stopped. The vote of the justices was strictly along party lines, with justices appointed by Republicans voting to end the recount and those appointed by Democrats for the count to continue. Bush thus was awarded the electoral votes of Florida and won the presidency.